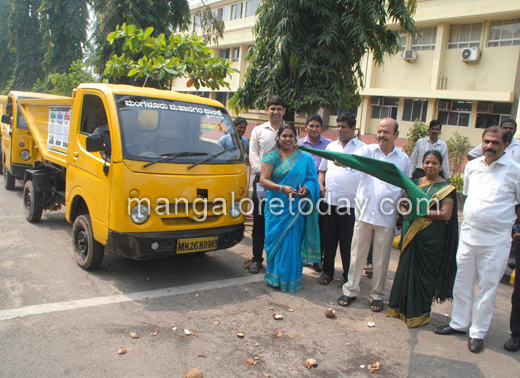 Mangaluru, Oct 26, 2016: Mangaluru City Corporation Mayor Harinath launched seven vehicles for the purpose of solid waste management, in front of the MCC building at Lalbagh on October 26, Wednesday. Earlier addressing media at MCC, Health Standing Committee President Kavitha Sanil said that MCC will be dedicating one of the days in the week to collect dry waste and the wet waste. 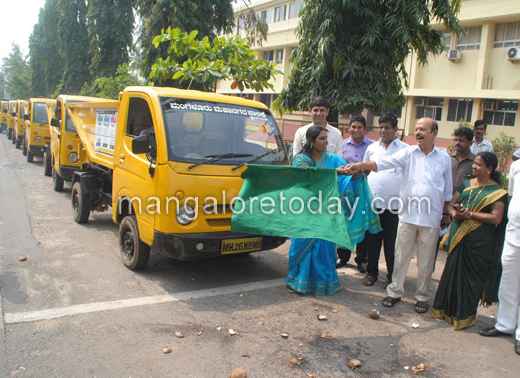 Several programmes have been launched under “Namma Mangaluru Swaccha Mangaluru” campaign to make Mangaluru clean and green, she informed. She also said that for the purpose of managing and recycling of the waste, people need to separate dry waste and wet waste. Wet wastes are: Kitchen waste like vegetable, fruits and food waste, meat waste and tissue paper. Dry Waste are: Plastic cover, Milk Cover, Chocolate Wrapper, Paper, Rubber, Coconut wastes, Glasses etc. People need to separate these wastes to make it easier for recycling and waste management, she said. 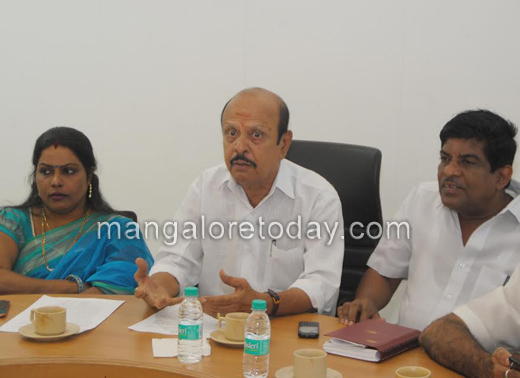 When asked about MRPL road, Mayor Harinath said that, council has called for short tender to repair the MRPL-Kana road. MRPL and its associate companies are to provide 70% of the share and MCC will provide 30% for the purpose of road construction. Concreting of the road requires about Rs 45 crores and collection of toll charges requires prior approval of the state government, the Mayor informed. When asked about Thumbay dam he said that, once new gate are installed on new dam, then the work on slit lifting will be undertaken. We asked the government for Rs 50 crore compensation for the land owners of 41 acres which need to be aquired. Waste management helps to keep the city clean. Co-operation of public is very important. It shouldn’t be like one way traffic. Thanks to MCC for taking measures for best waste management.